Washington, D.C. – Concerned Women for America (CWA), the nation’s largest public policy organization for women, is proud to announce the release of CWA Legal Counsel Mario Diaz’s new book, Be Spent: Winning the Fight for Freedom’s Survival. Published by Barbwire Books, Be Spent argues that the basic principles of freedom are the basic principles of Christianity. Therefore, Mario issues a bold call to those who believe in these principles to “be spent” in service to God and their neighbors, as the only answer to the preservation of freedom. Mario Diaz does us a great service by calling us back to the beautiful idea of ordered liberty. If the prophet’s gift is to remind us of “known but forgotten things,” as the poet Marion Montgomery said, then Be Spent is profoundly prophetic. We know our Lord can make something good out of any evil, but sometimes we wonder what good He could have brought out of the attacks on life and family and now religious freedom. It is, of course, the great coming together of His children who have largely put aside our differences in order to fight for life and faith and family. Mario Diaz is such a fighter, and the Lord’s spirit permeates this very fine book on our current travails. Be Spent represents Mario’s sincere passion and life. The public can expect an honesty and realness that is seldom seen today. I hope Be Spent ignites in readers the same passion Mario has for seeing God’s principles restored in our land. I stand with him in saying that freedom’s survival depends on it. 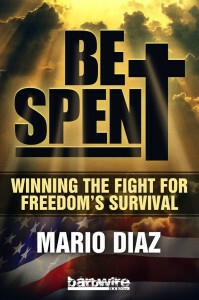 Be Spent is available now on Amazon and at the book’s official website, BEspent.com. Media queries: (202) 524-0746. Event/booking information: (202) 813-9725.